Denton, Texas, is a city that is about 40 miles north of Fort Worth, Texas. A Texas land grant led to the formation of Denton County in 1846. The city was not an early settlement. It was founded in 1857 in order to become the county seat because residents wanted one located near the center of the county. Hiram Cisco, William Woodruff, and William Loving donated 100 acres as the site for the town, which, like the county, was named in honor of John B. Denton. The charter provided for the election of a mayor and five aldermen. J. B. Sawyer was elected the first mayor. The county seat was moved from Alton to Denton. That same year, the county courthouse was built, and First Methodist Church was founded. The next year, Union Baptist Church was founded. But the city wasn’t incorporated until 1866. In 1868, the Denton Monitor newspaper began publication. 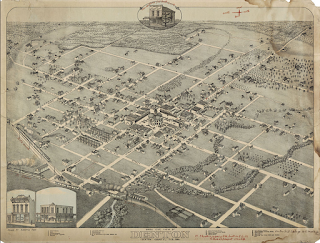 In 1870, Denton (and Texas) was readmitted to the Union after the American Civil War. 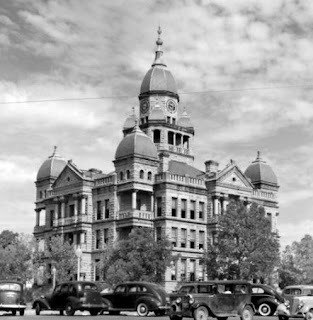 A fire with a mysterious origin destroyed the courthouse and many of the buildings surrounding the square in 1875. After the destruction of the wooden buildings, most of the new buildings in Denton were built of brick. By 1880, the city had reached a population of 1,194. But in the decade of the 1880's the city experienced its largest percentage growth in any decade up to the 1980s. The population more than doubled, to 2,558 in 1890, as the Texas and Pacific Railway from Sherman to Fort Worth and the Missouri, Kansas and Texas to Dallas, both completed in 1881, gave the city a rail outlet. Unfortunately, both of those railroads were only north/south lines. They had no connection with east/west rail lines. 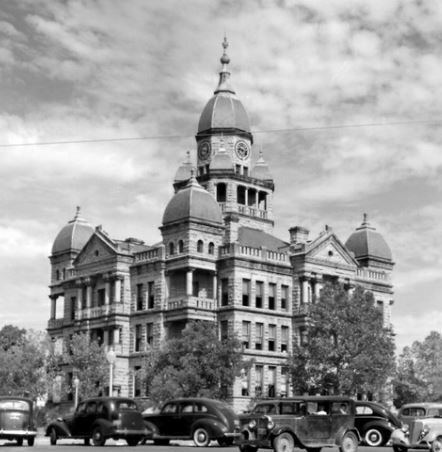 In 1882, the Denton Chronicle newspaper began publication, making Denton a two-newspaper town. That year, the fire station was built. In 1884, the first public school, which was secondary as well as elementary, opened in a two-story building near downtown. Ten years later the public school received the equivalent of accreditation by becoming affiliated with the University of Texas. 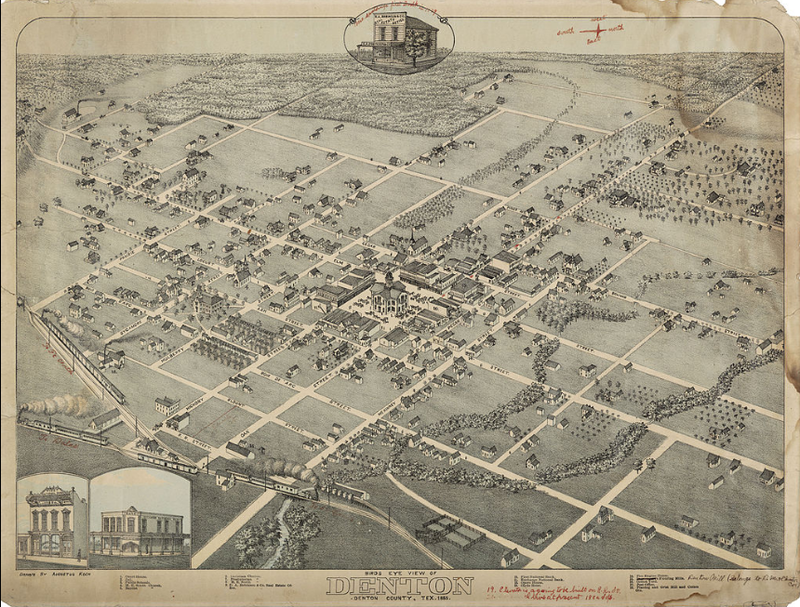 Only about a decade later, with the establishment of two colleges, Denton became known as a college town. I found the history of Denton so fascinating that I set one of my books in that city in 1896. Have you visited Denton, Texas? Is there another Texas town that's your favorite? I'm giving away a copy of Esther's Temptation. Leave a comment and your email to be entered in the drawing. Esther, feeling like an old maid surrounded by all her close friends who are happily married couples, is drawn to the intense gaze, blue as the Texas sky, of an unknown cowboy. But several things cause her to become wary of his intentions—and his spiritual well-being. Multi-published author Lena Nelson Dooley has had more than 950,000 copies of her books sold. She is a member of ACFW and the local chapter, ACFW – DFW, and a member of Christian Authors’ Network and Gateway Church in Southlake, Texas. 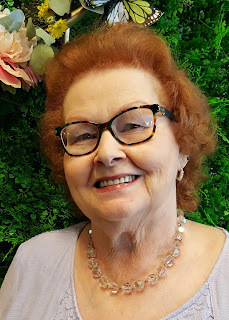 She has been on the ECPA and CBA Bestseller lists, Publisher’s Weekly bestseller list, and several Amazon Bestseller lists as well as a reviewer’s Top Ten Books of 2011. She has won over a dozen major awards. She hosts “The Lena Nelson Dooley Show” on the Along Came a Writer Blogtalk radio network. I’ve never spent any time in Texas. I did fly through the Dallas airport once on my way to a family vacation, but that is the extent of my Texas travels! Hi Patty, maybe you can come sometime and see more of the state. There are lots of interesting places to visit. I haven't been lucky enough to spend time in TX. Welcome to the blog, Lena! Good to see you, Connie. Where do you live? I have visited Texas a few times and have several relatives living there now, might have to make another trip. Thank you for the chance to win a copy of your book, I really enjoy your books. Where do your Texas relatives live, Wendy? Thank you for letting me know you like my books. I was blessed to be born and raised in Denton, Texas! I agree, it is a fascinating town, with Silk Stocking Row on Oak Street, the beautiful courthouse, the two universities and Denton’s geographical location smack dab in the center of the Crosstimbers. I can’t wait to read your book! Teresa, I love visiting Denton. We live in a suburb of Fort Worth. I hope you like the book. It's available in print, Kindle, and audio editions. I always enjoy going to Denton. In fact, I had lunch with friends there Saturday. Thank you for sharing your interesting post. It's good to see you here, Melanie. Maybe we'll get to see each other again sometime. I have only gone through Texas once on the way to Arizona. The thing that I was impressed with was the humongous produce. The biggest apples and oranges I've ever seen. My daughter was living in RoseSharon, Texas not long ago. I can't wait to read your book! Jan, maybe you can come visit that cousin. Yes, I've visited Denton. I lived in Carrollton for 13 years and left in 2007. I have heard of Denton and think I may have driven through it, but I have never really visited there. Thanks for the history behind the town, which is probably considered a city by now...lol. Thanks also for the giveaway. Betti, good to see you here. Yes, Denton is very much a city now. Good luck in the drawing. I have only driven through Texas, and it was very rainy. I just finished Gone to Texas by aryl McAdoo. I would love to read this book also. Thanks for the give a way.